They've been together for over 20 years, after first meeting at school aged just 14. 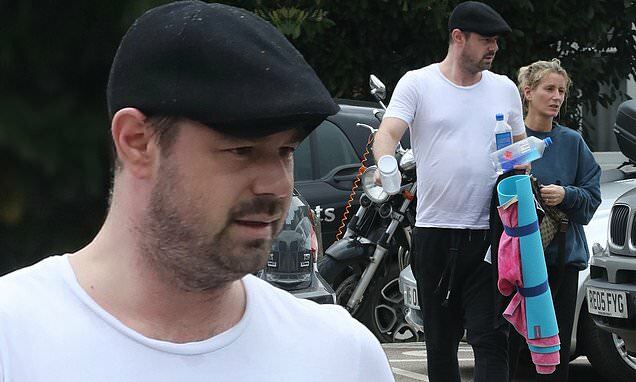 And Danny Dyer and wife Joanne Mas proved their love was still just as strong as ever as they were pictured leaving a yoga date on Monday. The couple, aged 41 and 42 respectively, didn't appear to have a care in the world as they made their way to their car following their workout session. EastEnders star Danny rocked a casual ensemble in a white t-shirt and black jogging bottoms, topped off with a black flat cap. He teamed this with a pair of white trainers as he clutched bottles of Fiji water, a yoga mat and what appears to be an official Love Island water bottle. Meanwhile, Joanne, whose daughter Dani Dyer, 22, coincidentally won the last series of Love Island, looked equally cosy in her relaxed ensemble. The mother-of-three donned a dark blue sweater, black jogging bottoms and blue and white sliders paired with socks. Their outing comes a day after they attended the Wonder Park screening with their son Arty, five, and a family friend at Leicester Square's Vue Cinema in London on Sunday afternoon. The actor looked effortlessly cool as he sported a sophisticated grey longline jacket and indigo jeans for the fun-filled outing. Protecting his eyes from the sun, the Outlaw star complemented his ensemble with a pair of stylish square-framed shades. Joanne, 42, opted for an equally chic appearance as she teamed a comfy black cardigan with black skinny jeans and box-fresh trainers.